On a wonderfully warm and sunny day before Storm Ophelia hits us on Monday, we returned to the Liverpool Thorn Collection on Templemore Avenue. We went there in May 2016 when the trees were flowering, but now we wanted to see them in autumn. 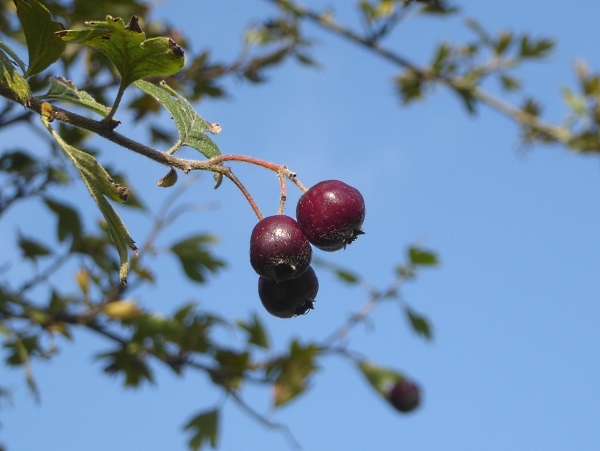 They are various rare relatives of the Hawthorn (Crataegus sp.) 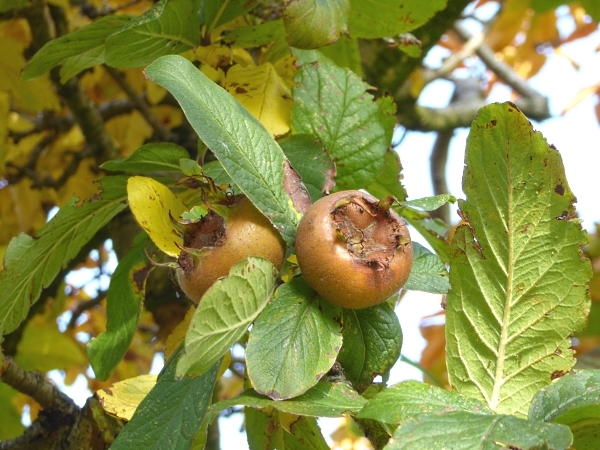 or Medlar (Mespilus sp.) and some are hybrids of the two. 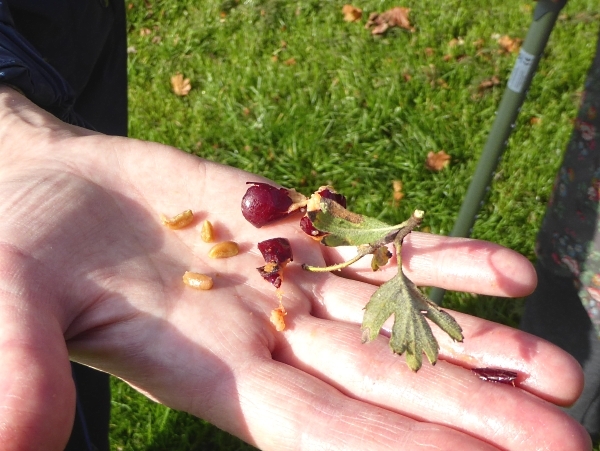 The “Grignon Hawthorn”, Crataegus x grignonensis, bore fairly normal-looking Haws, with the usual single seed. 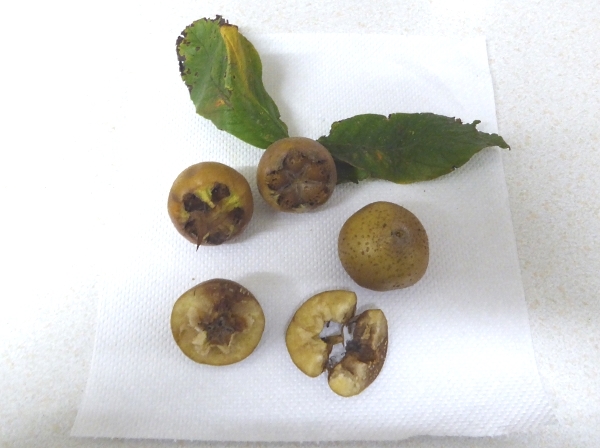 The Medlar Mespilus germanica was full of fruit, none of which had fallen. 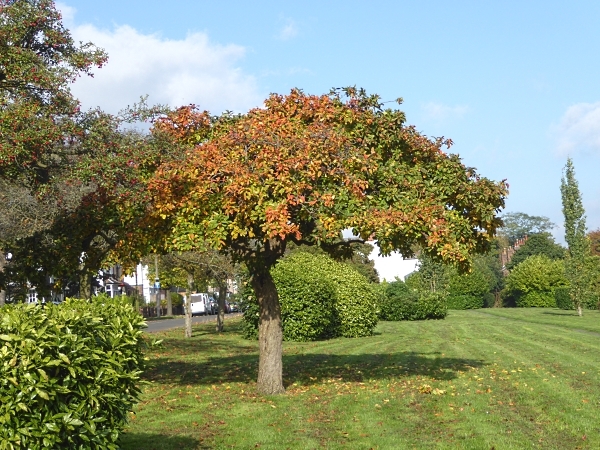 It’s a handsome small tree, now taking on its autumn colours. We were keen to see it because it is on our I-Spy list and worth 25 points, taking us to 1225. I was also interested to see what the fruit was like inside so I took some home. One was starting to “blet” (go brown, when it becomes edible), but the unripe flesh is white like an apple, and oxidises to brown very quickly. They are very hard to cut in half because the central five-lobed core is hard like a stone. The Fireberry, Crataegus chrysocarpa was next on our list, and we hoped to see some spectacularly-coloured golden berries. Sadly, it appeared to be dead, bare of leaves or any fruit. There are several other dead-looking trees nearby, or perhaps they all drop their leaves very early. A different nearby tree was flourishing, though. It had very dark red Haws, nearly black. When we opened one we were amazed to find it had four seeds inside, each with a triangular point, like segments of an orange. 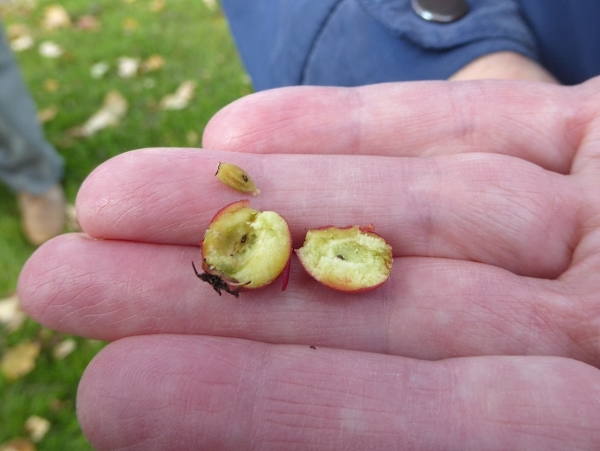 Apparently the Fireberry has three or four seeds too, so was this a living specimen? No, because C. chrysocarpa has oval leaves, hardly indented at all, but we thought this tree had leaves which were more indented, not less. No idea what it was. Then we walked up to Sudley House and had our lunch on the south-facing terrace. 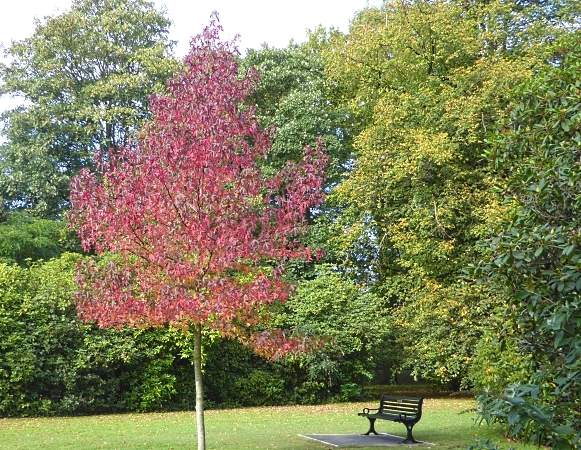 In the grounds we spotted our best autumn tree yet, this lovely young Sweet Gum Liquidambar styraciflua. Despite its initial appearance, this isn’t a Maple. Its leaves are all alternate whereas on Maples they are opposite. Sweet Gum leaves smell aromatic when crushed, which is another way to distinguish them from Maples. We had hoped to go into the walled garden, but it was closed due to vandalism. They run gardening sessions there for local people with “significant health issues and disabilities” but recently found evidence that someone had been camping, leaving rubbish and making a fire from some of their posts and canes. They had to lock it up. 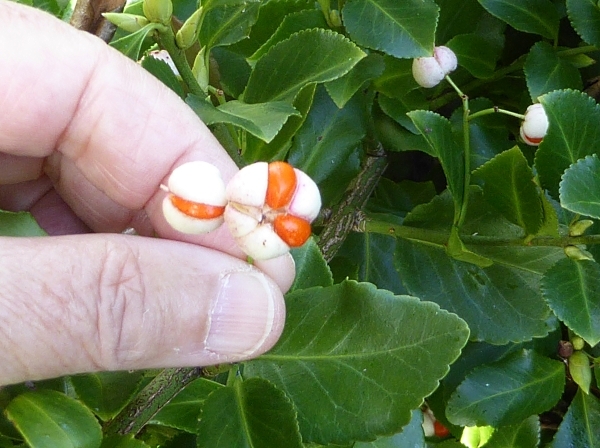 Nearby was our last interesting shrub, with white and orange seeds. 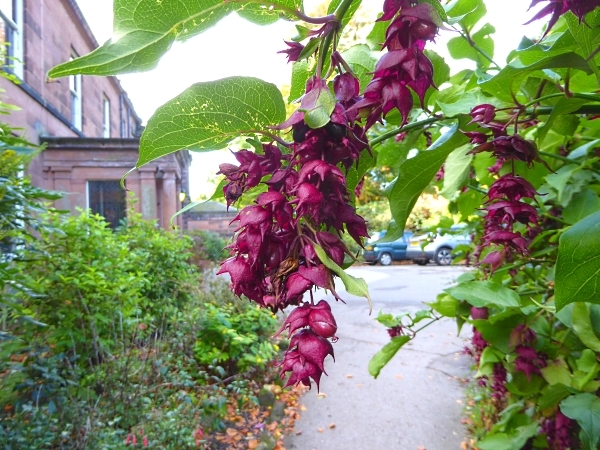 It’s the Japanese Spindle Euonymus japonicus. Public transport details: Bus 80A from Liverpool ONE at 10.34. (We had intended to get it at Great Charlotte Street but buses were diverted because of a Fun Run). Arrived Rose Lane / Templemore Avenue 11.07. Returned on 80A from Rose Lane / Mossley Hill Station at 1.55, arriving City Centre at 2.25.